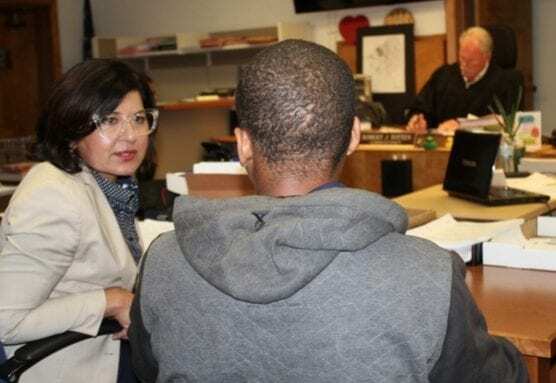 Deputy Public Defender Celia Benitez-Balderrama of CARE represents a youth in Commissioner Robert Totten's courtroom inside the Eastlake Juvenile Courthouse. The Los Angeles County Public Defender’s holistic approach to juvenile legal services has won the LA County Quality and Productivity Commission’s coveted Mega Million Dollar Award. Called Client Assessment Recommendation and Evaluation (CARE), this Juvenile Division program extends legal representation to include advocacy and service linkage. To greatly reduce recidivism, youths work with their trial lawyer in addition to in-house clinical social workers and resource attorneys who specialize in mental health and educational advocacy. The award is given to the program that generates the most cost savings, cost avoidance and/or revenue for the County. Since 1999, CARE has assessed and linked clients to critical services related to mental illness, intellectual or developmental disability, special education, commercial sexual exploitation, homelessness, trauma, abuse and neglect. After analyzing 886 youths who received services and 1,224 who did not, an independent study conducted by Resource Development Associates found that CARE clients had significantly less repeat contact with the juvenile justice system. A former client spoke highly of the program and the CARE social worker assigned to him. Since its inception, CARE has assisted on average 1,350 youths each year and some 20,000 children overall. In 2005, CARE was voted Program of the Year by the California Public Defenders Association and in 2008, CARE received the California Council on Mentally Ill Offenders (COMIO) “Best Practices” Award. The LA County Public Defender’s Office launched its holistic approach — expanding its legal efforts to include connecting clients to resources — in the late 1990s. The approach was implemented in the Mental Health Court to include social workers then to the Juvenile Division with the creation of CARE. The 2018 Productivity and Quality Awards Program will take place Wednesday, Oct. 10 at the Dorothy Chandler Pavilion Music Center’s Grand Hall.